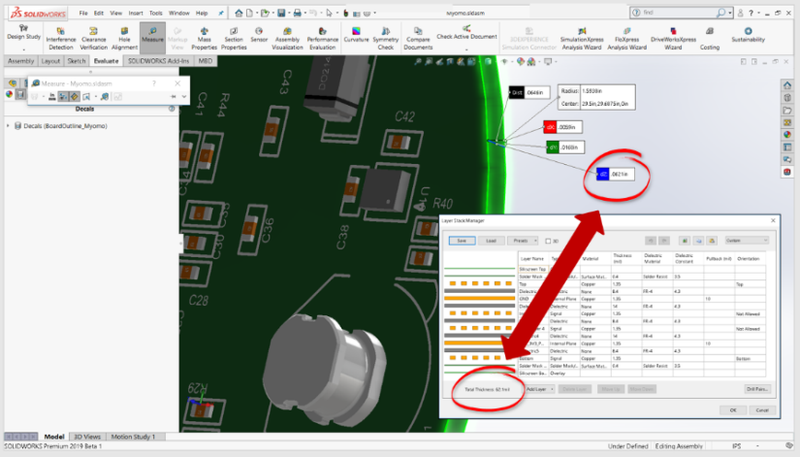 What's New in SOLIDWORKS PCB 2019? Taking collaboration to a completely new level! The top came from SOLIDWORKS CAD and the bottom, SOLIDWORKS PCB. The quality of the graphics is not only on par with each other, the data that was used to render both images was passed to each tool without an importing or exporting of files. The PCB Services, which comes with the purchase of SOLIDWORKS PCB or SOLIDWORKS Connector for Altium Designer, allows these tools to pass information in their native formats. These are not STEPs or parasolids; the information passed back and forth are real parts and primitives. No additional formatting or manipulation required. 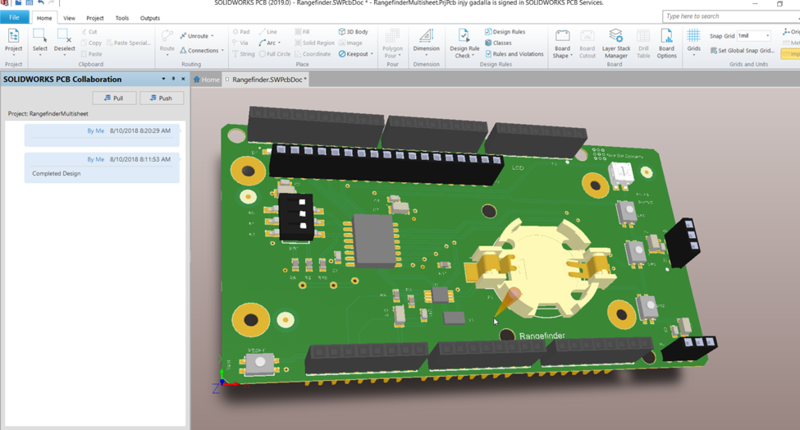 The 2019 version of SOLIDWORKS PCB has brought collaboration to a new level. Past versions were limited to board shapes and component movement. The new version enhances the existing capabilities while adding new features, making collaboration between the electrical and mechanical sides even more fluid and powerful. Support for Copper – Traces, Pads, and Polygons – from ECAD to MCAD – In prior versions, the passing of primitives from SOLIDWORKS PCB or SOLIDWORKS Connector to SOLDIWORKS CAD was limited to boards and components. With 2019, polygon pours (large copper areas), traces and footprints of the component can now be imported. Importing these copper features into SOLIDWORKS CAD helps avoid placing components in areas that would make copper routing difficult or impossible. 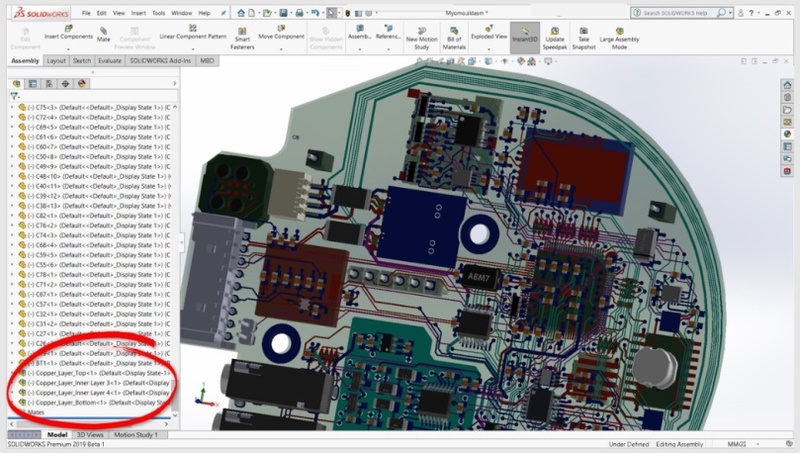 To limit the amount of information (and time) needed to be pushed between SOLIDWORKS PCB and SOLIDWORKS CAD, two options are provided, based on the end user’s need. Option 1 – Decals – Decals are simply ‘stickers’ that are placed on the board in SOLIDWORKS CAD. They are used for imagery, reference, and visualization. Option 2 - For those needing the actual copper primitives so additional simulation may be performed in SOLIDWORKS CAD, solid model copper can be imported for all layers. Support for Multi-Contour Hole Sketches – In the past, creating board holes in SOLDIWORKS CAD had to be handled in a specific manner. 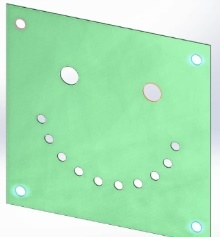 With 2019, both extrusions and Linear Patterns in SOLIDWORKS CAD can be used to create holes in the PCB board. Support for Silkscreen, Solder Mask, and Solder Paste from ECAD to MCAD – For those wishing to use SOLIDWORKS CAD for document creation for PCB manufacturing, layers such as silkscreen, solder and solder paste can be imported from SOLIDWORKS PCB and SOLIDWORKS Connector into SOLIDWORKS CAD. Support for Flipping Components between MCAD and ECAD – In prior versions, the flipping of components to the bottom side of a PCB was only handled through SOLIDWORKS PCB and SOLIDWORKS Connector. This can now be achieved in the SOLIDWORKS CAD. Support for Fix/Locking Components between MCAD and ECAD – By allowing both electrical and mechanical designers to lock what they consider to be key or critical components, efficiency is gained by not having to correct what had been undone. Accurate Board Thickness between ECAD and MCAD – With products having little space to house electronics, even the thickness of the board must be taken into consideration. With 2019, the copper layer stack up data in SOLIDWORKS PCB and SOLIDWORKS Connector is provided to SOLIDWORKS CAD for accurate drawings. These features, plus many more such as DXF/DWG export in SOLDIWORKS PCB, component search in SOLDIWORKS CAD, have been added to the 2019 version of SOLIDWORKS tool products.